The evolutionarily conserved DNA mismatch repair (MMR) system corrects base-substitution and insertion-deletion mutations generated during erroneous replication. The mutation or inactivation of many MMR factors strongly predisposes to cancer, where the resulting tumors often display resistance to standard chemotherapeutics. A new direction to develop targeted therapies is the harnessing of synthetic genetic interactions, where the simultaneous loss of two otherwise non-essential factors leads to reduced cell fitness or death. High-throughput screening in human cells to directly identify such interactors for disease-relevant genes is now widespread, but often requires extensive case-by-case optimization. Here we asked if conserved genetic interactors (CGIs) with MMR genes from two evolutionary distant yeast species (Saccharomyces cerevisiae and Schizosaccharomyzes pombe) can predict orthologous genetic relationships in higher eukaryotes. High-throughput screening was used to identify genetic interaction profiles for the MutSα and MutSβ heterodimer subunits (msh2Δ, msh3Δ, msh6Δ) of fission yeast. Selected negative interactors with MutSβ (msh2Δ/msh3Δ) were directly analyzed in budding yeast, and the CGI with SUMO-protease Ulp2 further examined after RNA interference/drug treatment in MSH2-deficient and -proficient human cells. This study identified distinct genetic profiles for MutSα and MutSβ, and supports a role for the latter in recombinatorial DNA repair. Approximately 28% of orthologous genetic interactions with msh2Δ/msh3Δ are conserved in both yeasts, a degree consistent with global trends across these species. Further, the CGI between budding/fission yeast msh2 and SUMO-protease Ulp2 is maintained in human cells (MSH2/SENP6), and enhanced by Olaparib, a PARP inhibitor that induces the accumulation of single-strand DNA breaks. This identifies SENP6 as a promising new target for the treatment of MMR-deficient cancers. Our findings demonstrate the utility of employing evolutionary distance in tractable lower eukaryotes to predict orthologous genetic relationships in higher eukaryotes. Moreover, we provide novel insights into the genome maintenance functions of a critical DNA repair complex and propose a promising targeted treatment for MMR deficient tumors. 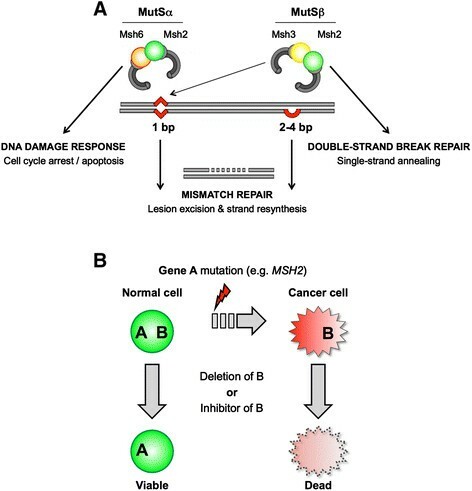 Defective DNA mismatch repair (MMR) is the underlying cause of hereditary non-polyposis colorectal cancer/Lynch syndrome (HNPCC/LS) and a significant proportion of sporadic colorectal cancers (CRCs) ,. The MMR genes most frequently mutated or epigentically silenced in these cancers are MSH2 and MLH1, which respectively function in the coordination of mismatch recognition and excision ,. The characteristic repair steps in MMR are highly conserved in bacteria, yeast, and mammals. In eukaryotes, the efficient recognition of distinct mismatches requires subsets of three different homologs of bacterial mutS: the MutSα heterodimer (MSH2-MSH6) initiates the repair of single-base mispairs and single-base insertion/deletions (IDLs), while MutSβ (MSH2-MSH3) primarily initiates the repair of larger IDLs of two to four bases but also facilitates the restoration of single-base mismatches  (Figure1A). Subsequent to mismatch recognition MutSα or MutSβ interact with MutLα (MLH1-PMS2) in an ATP-dependent manner to initiate excision of the appropriate DNA strand . During this process individual MutS and MutL subunits directly interact with PCNA, RFC, and RPA, indicating that mismatch excision is closely correlated with DNA replication . Synthetic lethality as a therapeutic strategy for the treatment of MMR-deficient cancers. (A) DNA mismatch repair is a stepwise process. In the schematic the MutSα heterodimer (Msh2-Msh6) recognizes a single-base mispair while MutSβ (Msh2-Msh3) primarily (but not exclusively -) initiates the repair of larger insertions/deletions (IDLs) of two to four bases. Recognition activates the recruitment of MutLα (Mlh1-Pms2) and multiple downstream factors (for example, Exo1, PCNA, RFC, RPA, and DNA pol δ) for repair by lesion excision and strand resynthesis. 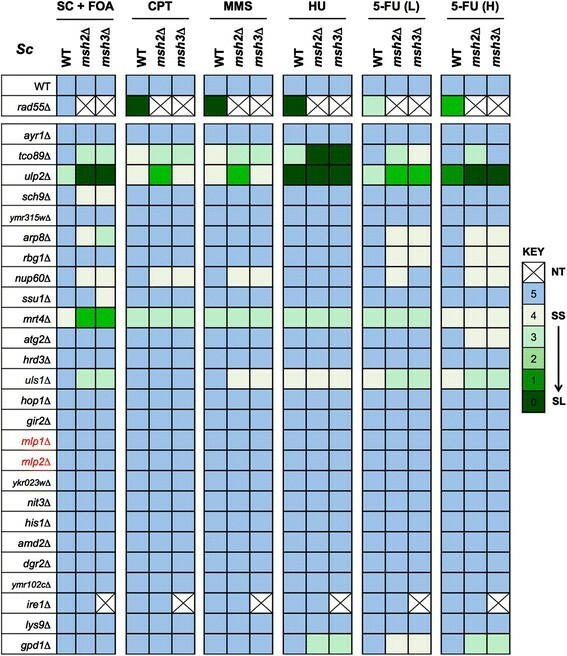 Each MutS also has roles independent of these downstream effectors of MMR: as an example, MutSα associates with cell cycle regulators at sites of DNA damage to mediate arrest and apoptosis , while MutSβ contributes to the repair of double-strand breaks via recombinatorial single-strand annealing ,. Mutations in many factors from this pathway are associated with cancer. (B) Loss of A (for example, MSH2) is a common initiating event in many colorectal cancers. Candidate screening seeks to identify and exploit negative genetic relationships (synthetic sick/lethal) to selectively kill cells that harbor the MSH2 deficiency, but spare those lacking this cancer-related alteration. As a consequence of their defective MMR, HNPCC/LS tumors and sporadic CRCs display increased rates of replication errors at short repeat sequences, termed microsatellite instability (MSI). MSI-positive tumors exhibit resistance to DNA damaging agents, and thus respond poorly to conventional chemotherapy ,. Of additional concern, the treatment of these patients with chemotherapeutic agents can induce secondary therapy-related leukemias (for example, acute myeloid leukemia/myelodysplastic syndrome) ,. Indeed it has been suggested that the primary treatment of HNPCC/LS with chemotherapeutics actually selects for hematopoietic precursor cells with MMR-defects . As these cells proliferate they accumulate further mutations and develop increased resistance to anticancer agents. Thus the development of novel therapeutic strategies that efficiently and selectively target the primary MMR-deficient cancer but avoids therapy-induced secondary tumors would be highly desirable. A promising new direction to develop targeted therapies is the harnessing of synthetic genetic interactions, where the simultaneous loss of two otherwise non-essential factors leads to reduced cell fitness (synthetic sickness (SS)) or cell death (synthetic lethality (SL)) ,. This provides great functional insight: an SS/SL interaction for two alleles often indicates that their gene products are in parallel pathways or impinge on the same essential function. However it can also provide an elegant strategy to selectively eliminate tumor cells that harbor specific cancer-causing mutations. In this manner, the protein products of genes SS/SL to cancer-causing mutations represent potential drug targets (Figure1B). As an example, inhibitors of poly-ADP-ribose polymerase I (PARP; required for the repair of single-stranded DNA breaks) are lethal to cells with deficiencies in BRCA1 or BRCA2 and show promise in the treatment of breast cancer ,. A range of approaches can be used to search for SS/SL interactions with therapeutic intent, the most direct being RNA interference-based screening by si/shRNA libraries in human cells ,. Although RNAi lends itself to high-throughput, incomplete knockdowns or off-target effects are commonly observed, and the large scale-format precludes single-case optimization. There are additional issues related to cost, that robotic sample handling might limit the type of read-out assay, the requirement for easily transfectable cell-lines, and even the possibility that an SS/SL interaction might be cell-type specific. Despite these potential concerns, various studies describe the successful application of high-throughput RNAi-based approaches to investigate mammalian gene function -. Indeed recent analyses identified the synthetic combinations MSH2/DNA pol β, MLH1/DNA pol γ, and MSH2/dihydrofolate reductase ,. This directly demonstrates the existence of SS/SL interactions for mammalian MMR genes, although both DNA polymerases are essential in knockout mice and contribute to high-fidelity replication in dividing cells ,, which may limit their potential as therapeutic targets. Genetic interaction screening in tractable model organisms constitutes a powerful alternative approach for candidate identification. Defining the function of a gene product in budding and fission yeasts (Saccharomyces cerevisiae (Sc) and Schizosaccharomyces pombe (Sp), respectively) has proven highly predictive of the role of its metazoan ortholog ,. These yeasts separated approximately 380 million years ago  (by comparison, the last common predecessor of the entire mammalian class existed about 165 mya ), but share substantial gene content, with approximately 75% of Sp genes having one or more Sc orthologs -. This high level of conservation commonly extends to functional units, such that many yeast complexes are reminiscent of their metazoan counterparts ,. High-throughput genetic interaction mapping approaches have been developed for both yeasts to evaluate the genetic interactions of null, hypomorphic, or mutant alleles in a genome-wide manner ,,. These techniques, in combination with the comprehensive deletion libraries available for both species ,, have been used to provide an overview of the functional dependencies within eukaryotic cells, and give insight into both the function of individual genes and the organization of biological systems -. Furthermore, cross species comparison has identified a high conservation (19% to 29%) of SS/SL interactions between orthologous gene pairs in Sc and Sp,,,. Here we surmised that complementary genetic analyses of specific MMR genes in the evolutionary distant S. cerevisiae and S. pombe could be used to dissect the function(s) of each individual factor. We further posited that screening against non-essential gene deletions could maximize the potential of identifying SS/SL interactions with potential therapeutic utility. Moreover the identification of Conserved Genetic Interactors (CGIs: SS/SL in both yeasts) could then be tested as candidate drug targets in MSI-positive CRC cell lines. An obvious potential limitation of this approach is the requirement for a high degree of conservation between the yeast and human orthologs. In this regard the MMR factors are particularly well conserved across evolution, which extends to preserving the same repair functions : thus CGIs for each yeast gene might be expected to have strong predictive power for their mammalian orthologs. Constructs for de novo gene deletion were assembled by PCR megapriming from budding or fission yeast genomic DNA and plasmid templates ,. The resulting products were transformed/targeted by homologous recombination in the desired budding or fission yeast backgrounds and confirmed by sequencing and/or phenotypic analyses as appropriate . Genetic screening in fission yeast used the PEM-2 approach ,. In brief, NAT-marked (encoding nourseothricin resistance) queries in the PEM-2 background (p392; KFP171) were crossed to a library of 1,955 non-essential gene deletions, with mating, haploid selection, data acquisition, and analysis as previously. Specific interactions of interest were further examined by direct mating, tetrad dissection and spot-testing. Pairwise correlation coefficients (CCs) to examine any relationship between genetic screens were calculated by the CORREL function in Excel. Many MMR factors participate in meiosis , such that some genetic interactions in fission yeast could be the result of a meiotic defect rather than manifesting during mitotic growth. To avoid this possibility genetic interactions in budding yeast were examined after direct transformation, plasmid shuffling by 5-fluoroorotic acid (5-FOA) selection, and spot-testing. In brief, specific deletions (as KAN cassettes flanked by approximately 500bp of genomic sequence) were amplified from the relevant heterozygous diploid library strain (Open Biosystems), transformed to the appropriate msh2Δ or msh3Δ shuffle strain (with each NAT-marked genomic deletion covered by the relevant wild-type allele on a low-copy URA3 containing plasmid), and homologous-integration events identified by PCR. Replicate clones were successively grown on media containing uracil (to allow loss of the URA3 plasmid) and 5-FOA (converted to a toxic metabolite in the presence of a functional URA pathway, thus isolating double deletion cells). Spot-testing was then performed to evaluate the fitness of the double deletion clones versus their single deletion parents. Any sensitivity to genotoxins was investigated by spotting onto solid media with various concentrations of each agent: camptothecin (CPT) (5, 7.5, and 10µM), methyl methanesulfonate (MMS) (0.005%, 0.075%, and 0.01%), hydroxyurea (HU) (5µmM, 7.5µmM, and 10mM), or 5-fluorouracil (5-FU) (38µM and 76µM). Strains were spotted as 10-fold serial dilutions onto the relevant plates and growth examined at 48, 72, and 96h. Standard methods were used to examine any genetic interactions in the MSH2-deficient human endometrial cancer cell line HEC59 (MSH2 − ) and its isogenic chromosome 2-complemented counterpart (MSH2 + ) . Transfections with siRNAs (Dharmacon; sequences in Additional file 1) and the Trans IT-siQUEST (Mirus) reagent were performed in six-well plates by specific optimization of the manufacturer’s suggested conditions. Total RNA was isolated by the RNeasy plus kit (Qiagen) 24h after siRNA transfection, cDNA synthesized with random hexamers and the Superscript III reverse transcriptase (Invitrogen), and specific transcript levels measured by qPCR (after pre-amplification if required) . SENP6 protein levels in permeabilized cells 48 h after siRNA transfection were measured by fluorescence cytometry after successive staining with monoclonal mouse anti-human SENP6 (Novus Biologicals) (or an isotype control antibody: eBioscience) and anti-mouse IgG2a-PE (eBioscience) (Additional file 1: Figure S1). Apoptosis in specific populations was quantified by activated caspase 3. In brief, cells were trypsinized, stained with LIVE/DEAD fixable violet (Invitrogen), fixed with 2% paraformaldehyde, and permeabilized with 0.3% saponin. Each sample was then successively stained with rabbit anti-caspase 3 (Cell Signaling Technology) and goat anti-rabbit IgG-Alexa488 (Molecular Probes), and analyzed by fluorescence cytometry. DNA double strand break levels in specific populations was quantified by ƔH2AX. In brief, 72h after siRNA transfection/24h after PARP inhibition (20µM olaparib), cells were permeabilized with Transcription Factor Buffer (BD Pharmingen), successively stained with rabbit anti-γH2AX (Cell Signaling Technologies) and goat anti-rabbit IgG-Alexa488, and analyzed by fluorescence cytometry. To estimate clonogenic survival, cells were re-plated 72h after siRNA transfection/24h after PARP inhibition (5µM olaparib). In brief, cells were collected after each treatment (of triplicate wells), resuspended in the same volume of media, diluted 1/500, and an equal aliquot from each sample re-plated and incubated for 2weeks. Cells were fixed with 2% paraformaldehyde, stained with crystal violet, colonies counted, and the clonogenic potential after each treatment of each population expressed relative to the respective siNT-1 (no drug). For this study three specific MMR genes involved in mismatch recognition (MSH2, MSH3, and MSH6, comprising subunits of the MutSα and β heterodimers: Figure1A) were chosen for direct analysis. MSH3 mice have late onset intestinal tumors and MSH3-deficiency modifies the tumor spectrum of p53 mutant mice ,. MSH3 mutations are rarely seen in HNPCC/LS, although frame-shifts at repeat sequences within the gene are frequently detected in MSI positive CRCs ,,. MSH2 is frequently mutated in HNPCC/LS, while MSH6 mutations are more rare (although MSH6, like MSH3, is also commonly frame-shifted in MSI positive CRCs ,). Thus the specific genetic interactors of each gene could identify novel therapeutic targets for these conditions. Comprehensive genetic interaction data for all three factors would also be expected to distinguish the relationship of MutSɑ and MutSβ with other repair pathways or biological processes. Appropriate deletion strains (for example, msh2Δ::NAT) were mated to a library of 1,955 deletions (approximately 52% of the non-essential Sp genome ), and double-mutant haploid daughters selected with the Pombe Epistatic Mapper-2 (PEM-2) approach , (see Methods). We then used colony size (compared in high-throughput by photography and image analysis) as a quantitative readout to derive scores covering each negative genetic interaction (<-2.5: SS/SL) ,. Of note, the deletion of msh3 leads to a modest increase in mutation rates , while msh2Δ or msh6Δ each reduce the fidelity of DNA replication >100-fold in S. pombe, S. cerevisiae and mammals . The resulting accumulation of secondary mutations had the potential to compromise our genetic screening, so multiple independent clones of each deletion were analyzed to obtain a high-quality dataset (Figure2A). To date we have screened 953 query alleles against an array of 1,955 non-essential deletions and comprehensive benchmarking confirms the value of this resource: known SS/SL interactions are reproduced, and protein-protein interactions are accurately predicted ,. Analysis of the msh2Δ, msh3Δ, and msh6Δ replicates confirm these global trends, with their data being highly correlated (Pearson correlation co-efficient (CC) >0.4) indicating that individual SS/SL predictions are highly reproducible (for example, Figure2A and B). Genetic screening distinguishes the MutSβ complex in actively growing yeast. (A) The specific genetic interactions of fission yeast msh2Δ and msh3Δ are similar and distinct from msh6Δ. NAT-marked deletions (for example, msh2Δ::NAT) were placed in the context of 1,955 non-essential fission yeast gene deletions and relative colony size used to derive scores covering each negative (≤ -2.5) genetic interaction (see Methods). Shown are a representative set of 53 genetic relationships expressed by heat map (key below) and identified by their systematic ID and standard Sp/Sc (if present) gene names. Blue, orthologous relationships also tested in budding yeast (see Figure3). Red, Sp-specific orphans. Given the high rate of replication-errors in MMR-gene mutants ,, multiple queries of each deletion were screened to obtain a high confidence dataset. The independent accumulation of confounding secondary mutations may explain why the specific genetic interactors from this study are not described in the available high-throughput datasets that relied on single deletion clones ,,. (B) Distribution plot of Pearson correlation co-efficients (CCs) comparing the genetic interaction profiles of msh2Δ and msh3Δ within a (953×1,955) dataset. Red dots indicate the CC of each genetic screen to a specific msh2Δ or msh3Δ query clone: shaded area highlights screens that would be classed as significantly correlated (CC ≥0.2). The genetic interaction (GI) profile of a mutant allele comprises its set of interacting partners, or in the case of our quantitative screening, the set of scores for these interactions (for example, Figure2A). GI profiles have been used to predict gene function with high confidence, while the degree of similarity to other mutant profiles can reveal how groups of gene products cooperate in higher-level biological processes ,,,. As an example, Msh2 enters into heterodimeric complexes with Msh3 and Msh6, so it might be expected that the set of genetic interactions for msh2Δ would encompass those observed on deletion of both its partners. Alternatively, since MutSα (Msh2-Msh6) is sufficient for the majority of fission yeast MMR , the genetic interactions for msh2Δ and msh6Δ could have been very similar. To investigate this we compared the profile for each mshΔ within our (953×1,955) dataset , with significant relatedness considered a Pearson CC >0.3 ,,. In this approach msh2Δ had no discernible relationship to msh6Δ, but was instead highly correlated with msh3Δ (Figure2B). We considered that msh2 and msh3 may be genetically related by their loss of function in a process other than MMR. Budding yeast MutSβ also acts with the Rad1-Rad10 nuclease to remove non-complementary tails during DNA DSB repair by homologous recombination  (Figure1A). We thus noted with interest that the GI profiles of msh2 and msh3 were both highly correlated with those of fml1 (Sc Mph1; ATP-dependent 3′ to 5′ DNA helicase, FANCM ortholog), rhp55 and rhp57 (both RecA family ATPases), and rhp51 (Sc Rad51; RecA family recombinase) (Figure2B), all of which regulate DNA double-strand break (DSB) repair by recombination ,. Thus the similar GI profiles of fission yeast msh2Δ and msh3Δ might be due to their shared role in recombinatorial rather than mismatch repair ,,. Network analyses suggest that the average orthologous gene has significantly more genetic interactions than sequence orphans (that is, genes with no identifiable orthologs in other species) . The MSH genes are highly conserved, yet msh6Δ showed an unexpectedly low percentage of negative GIs relative to all profiles in our (953×1,955) dataset (4.6% msh2Δ; 2.5% msh3Δ; 1.1% msh6Δ vs. 3.8% average ). This distinction from the general trend suggested a limited cross-talk between Msh6 and other pathways: this could be because its protein product acts exclusively in MMR, although such an interpretation is made with caution. In this study genetic interactions were revealed by the specific read-out of altered colony size on rich media. Repeating these analyses in the presence of genomic stress (for example, genotoxin-induced damage) might uncover additional, or an altered spectrum, of synthetic interactions ,, and thus reveal more functional relationships for MutSΔ. We next sought evolutionarily conserved genetic interactions (CGIs) for fission and budding yeast msh2Δ/msh3Δ to identify orthologous relationships of possible utility in mammalian systems. Twenty-six candidates (25 one-to-one orthologs and the paralogous pair mlp1/mlp2) from the fission yeast SS/SL dataset (for example, Figure2A) were chosen for direct study by satisfying three criteria: synthetic with both msh2Δ and msh3Δ; identifiable Sc and human/mouse orthologs (or a limited group of paralogs); and non-essential in both Sc and human/mouse, thus increasing their potential therapeutic utility. Each mutant combination was created and examined for growth on rich-media and any additional sensitivity to genotoxins, which included 5-fluorouracil (5-FU). This agent is a commonly used chemotherapeutic for colorectal cancer, although MMR-deficient MSI-positive tumors display resistance ,: thus synthetic chemo-sensitization in any double-mutant background would be of particular interest. Testing these 26 candidates identified seven orthologous negative interactions, with a genotoxin-aggravating effect on the double mutant observed in most cases (Figure3). This moderate number of CGIs for msh2/msh3 (7/25 or approximately 28%) is consistent with recent studies interrogating the conservation of global genetic interaction trends across both yeasts ,. The large-scale studies had further noted that GIs within functionally related gene pairs (such as those involved in the same pathway or process) are more highly conserved across species than those between seemingly unrelated gene pairs ,. However the specific CGIs for msh2Δ and msh3Δ (Figure3) appear to be involved in quite diverse biological functions. Tco89, for example, is a subunit of the TORC1 complex that regulates growth in response to nutrient availability ; Sch9 is an AGC family protein kinase downstream of TORC1 mediated regulation of ribosome biogenesis, translation initiation and entry into G0 ; Nup60 is a nucleoporin component of the nuclear pore complex  and involved in gene tethering to the nuclear membrane; Arp8 is an actin-related protein and subunit of chromatin remodeling complexes ; and Mrt4 regulates mRNA turnover and ribosome assembly . Although the molecular basis for these genetic interactions is currently unclear, their conservation across such evolutionary distance indicates functional importance and may reflect the diverse pathways involved in genome maintenance. The CGIs between msh2Δ/msh3Δ and tco89Δ, for example, may reflect the sensitivity of MMR-deficient colorectal cancer cells to mTOR inhibition by rapamycin . Likewise the CGIs with nup60Δ may be linked to the role of the (Nup60/Mlp1-2) nuclear pore complex in maintaining SUMO-protease Ulp1 at the nuclear envelope to regulate the sumoylation of several proteins, including DNA repair factors . Direct testing identifies conserved orthologous relationships with MutSβ in fission and budding yeast. Negative interactions from fission yeast were tested for orthologous conservation and potential synthetic chemo-sensitivity in budding yeast. msh2Δ- or msh3Δ-containing strains were created by plasmid shuffling and spotted as serial 10-fold dilutions onto the indicated medium (see Methods). To facilitate cross-comparison results are expressed by a color-code indicating the growth of each strain on a six-point scale relative to wild-type in each condition (all after incubation at 30C for 72h). rad55Δ is a positive control for genotoxin sensitivity . Hatch-bar, not tested; YPD, non-selective media; CPT (5μM); MMS (0.005%); HU (5mM); 5-FU (L ow dose, 38μM); 5-FU (H igh dose, 76μM). The group of CGIs common to msh2Δ and msh3Δ contains two additional factors involved in protein sumoylation: Ulp2 (Sc Ulp2) and Rrp1 (Sc Uls1) (Figures2A and 3). The Ulp2 peptidase deconjugates SUMO polychains from proteins and plays a role in the recovery from checkpoint arrest induced by DNA damage or replication defects ,. The Rrp1 ATPase regulates the proteolytic control of sumoylated substrates and the response to replication stress ,. This cluster of CGIs strongly suggested a `cross-talk between MutSβ and the SUMO pathway. The (msh2Δ/ulp2Δ) interaction is synthetic lethal in fission yeast (Figures2 and 4A), synthetic sick and aggravated by 5FU (a commonly used chemotherapeutic agent) in budding yeast (Figure3). We thus chose to perform a more detailed genetic analysis of this specific CGI in fission yeast before further testing the orthologous relationship in mammalian cells. Increased polysumoylation is lethal in msh2Δ fission yeast. (A) Deletion of the Ulp2 SUMO-protease is synthetic lethal (SL) with msh2Δ. msh2Δ and ulp2Δ strains were mated, sporulated, tetrads dissected and genotypes determined ((ulp2Δ/msh2Δ) is boxed). (B) Schematic depicts the sumoylation pathway. Fission yeast contains one gene encoding SUMO (Smt3), two E3-ligases (Pli1 and Nse2), and two SUMO proteases (Ulp1 and Ulp2). (C) msh2Δ is SL with ulp2Δ but neutral with ulp1Δ. Strains were mated, sporulated, and tetrads dissected. The number of viable spores observed/expected for each genotype is indicated (see also Additional file 1: Figure S2A and B). (D, E) smt3Δ or nse2-SA (catalytic dead), but not pli1Δ, rescue the lethality of (msh2Δ/ulp2Δ). Strains were mated, sporulated, and the indicated number of tetrads dissected (see also Additional file 1: Figure S2C to E). Panel (E) depicts representative tetrads to demonstrate the growth of each mutant combination. Sumoylation is a reversible post-translational modification that controls the localization, function, interaction, and stability of a large number of proteins, including many involved in transcription, replication, and the DNA damage response . Indeed recent studies highlight the importance of a reversible SUMO-response to preserve genome integrity ,. Fission yeast encodes one form of SUMO (Smt3 aka. Pmt3), two SUMO E3-ligases (Pli1 and Nse2), and two SUMO proteases (Ulp1 and Ulp2; Figure4B). Pli1 catalyzes the majority of cellular sumoylation, while Nse2 targets a limited number of substrates during DNA repair ,. For deconjugation, Ulp1 removes single SUMO modifications and is required for efficient cell cycle progression ,. Ulp2, in contrast, edits poly-SUMO chains, desumoylates the majority of factors activated in response to DNA damage or DNA replication defects, and regulates the recovery from checkpoint arrest ,,,. 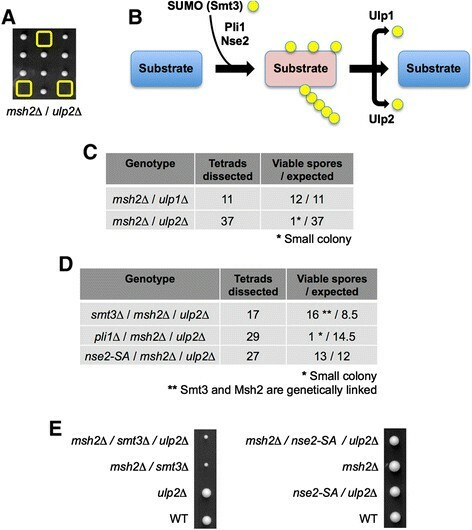 On direct testing the SL interaction of (msh2Δ/ulp2Δ) is not observed with (msh2Δ/ulp1Δ) (compare Figure4A and C), indicating that the accumulation of specific sumoylated substrates is toxic to fission yeast cells that also lack an Msh2-mediated repair pathway. This may be because Msh2 is absolutely required to resolve lesions that occur at increased levels in the context of ulp2Δ . Alternatively cells lacking Msh2 might accumulate unresolved DNA damage and induce a poly-sumoylated substrate (or substrates) that cannot be metabolized in the absence of Ulp2, blocking cell cycle progression . The identity of such substrates is currently unknown, though many central players in replication and recombination (for example, Rad52, PCNA, RPA) are sumoylated in response to DNA damage, and this is important for their repair function . To investigate this further we tried to create triple mutants containing msh2Δ, ulp2Δ and a mutation in either SUMO itself (pmt3Δ) or one of its E3-ligases (pli1Δ, or the nse2-SA allele that lacks SUMO ligase activity but retains the essential function for Nse2 in chromosome maintenance ). Following tetrad dissection we obtained the triple mutant combinations (msh2Δ/ulp2Δ/pmt3Δ) and (msh2Δ/ulp2Δ/nse2-SA), but not (msh2Δ/ulp2Δ/pli1Δ) (Figure4D and E and Additional file 1: Figure S2). This clearly demonstrates that msh2Δ is lethal in combination with a deletion of Ulp2, the primary protease to desumoylate DNA damage response proteins ,, but this can be rescued by inactivating the primary ligase for sumoylation in response to DNA damage ,. We next sought to examine if the CGI between budding and fission yeast msh2 and ulp2 predicted an orthologous relationship in human cells. Humans encode four SUMO proteins (SUMO1-4 with relatedness: SUMO1, SUMO2/3, unconjugated SUMO4) and six SUMO-specific cysteine proteases (SENPs). Of these, SENPs 1/2/3/5 are most closely related to Ulp1 and specifically deconjugate single SUMO1/2/3, while SENPs 6/7 resemble Ulp2 and edit polysumo chains with a clear preference for SUMO2/3 -. A limited literature discriminates the distinct roles of mammalian SENP6 and SENP7 -. However both are expressed in a variety of tissues including the colonic epithelium  and thus might be active in MMR-deficient colorectal cancer cells. To investigate any relationship between human MSH2, SENP6, and SENP7 we used siRNA to efficiently knockdown each SUMO protease in HEC59 cells (an Msh2-deficient endometrial cancer line) and their isogenic chromosome 2-complemented MSH2 proficient counterparts (Figure5A to D). SENP6 knockdown resulted in significantly increased apoptosis in MSH2-deficient relative to MSH2-proficient cells (Figure5E), reproducing the negative genetic interaction identified in budding and fission yeasts (Figures2A and 3). Interestingly SENP7 knockdown had no effect (Figure5E). This SUMO protease was recently shown to interact with chromatin remodelers and contribute to chromatin relaxation during DNA repair by homologous recombination -. However our results indicate that the effect of SENP7 knockdown on recombinational repair does not lead to increased apoptosis in MSH2-deficient cells. 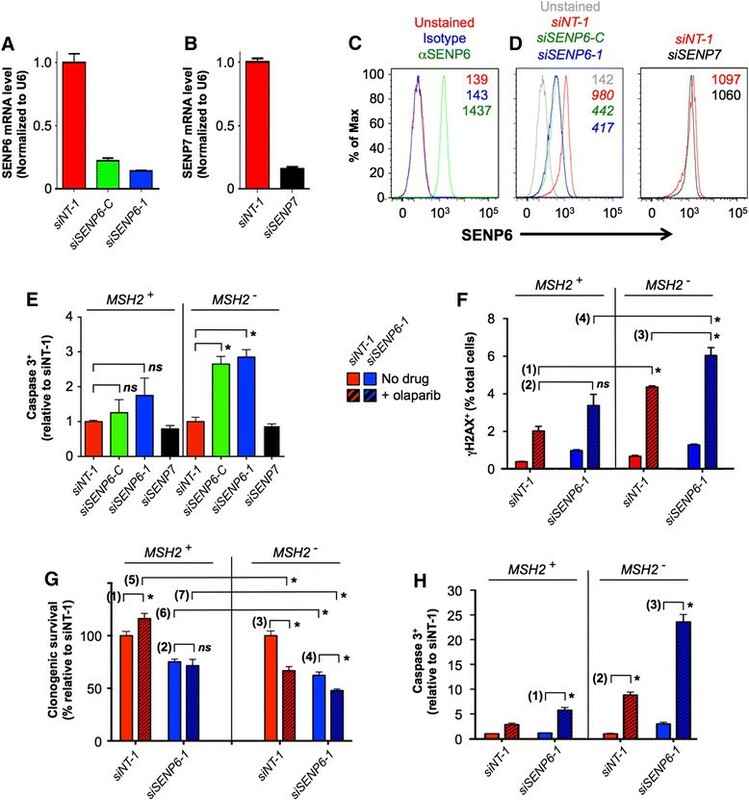 SENP6 knockdown induces a hyper-acute apoptotic response in MSH2-deficient human cells. (A-D) Efficient targeted knockdown of SENP6 or SENP7 in MSH2-deficient HEC59 cells. In A, B mRNA was quantified by qPCR; in C, D SENP6 protein was detected by flow cytometry (see Methods). Note specificity of SENP6 knockdown in response to siSENP6-C or siSENP6-1, but not siSENP7 (pooled siSENP7-1 and siSENP7-2) or non-targeted siNT-1. (E) SENP6 (but not SENP7) knockdown induces apoptosis in HEC59 cells (MSH2") relative to an isogenic chromosome 2 complemented population (MSH2+). Caspase 3+ cells were identified 48h after siRNA transfection (see Methods), normalized to siNT-1 in each population, and significance determined by unpaired t-test (ns, not significant; *, P <0.01). (F) PARP inhibition induces DNA DSBs (γH2AX+), and to a greater degree in MSH2 − cells. γH2AX+ cells were identified 72h after siRNA transfection/24h after PARP inhibition (20μM olaparib; see Methods) and the significance of pairwise comparisons determined by unpaired t-test: (1) P <10−4; (2) ns, not significant; (3) P <0.008; (4) P <0.002. Panels (F-H) use the same color key and siSENP6-1 for SENP6 knockdown (previous studies suggest off-target effects are unlikely ). (G) MSH2 − cells show reduced clonogenic survival (see Methods) in response to SENP6 knockdown, PARP inhibition, or their combination. Any significance of indicated pairwise combinations was determined by unpaired t-test: (1) P <0.02 (may be related to the additional copy of chromosome 2); (2) ns, not significant; (3) P <0.001; (4) P <0.01; (5) P <0.0007; (6) P <0.03; (7) P <0.01. (H) (MSH2/SENP6) deficient cells exhibit a hyper-apoptotic response to PARP inhibition. Activated caspase 3 levels 72h after siRNA transfection/24h after PARP inhibition (20μM olaparib) were quantified by flow cytometry and normalized to siNT-1 (no drug). Any significance of various pairwise combinations was determined by unpaired t-test: (1) P <10−5; (2) P <10−6 (also seen with MSH3 − ); (3) P <10−7. Human SENP6 maintains the hypo-sumoylation of RPA70, and thus regulates homologous recombination-mediated repair during S-phase . This finding allied with our results in yeast may imply that the conserved synthetic interaction between MSH2/msh2 and SENP6/ ulp2 is due to the combined loss of MutSβ- and RPA-mediated DNA DSB repair. Consistent with this notion, the addition of Olaparib (a PARP inhibitor that induces the accumulation of ssDNA breaks that ultimately result in DSBs during replication -) rendered a significantly greater number of γH2AX+ cells in the (MSH2/SENP6) deficient population versus singly-deficient controls (Figure5F). This is accompanied by the reduced clonogenic survival of MSH2 - cells in response to SENP6 knockdown, olaparib treatment, or their combination (Figure5F). In isolation this synthetic interaction provides no direct mechanistic insight, but further analyses showed that the (MSH2/SENP6) deficient population also displayed a hyper-acute apoptotic response to olaparib (Figure5H). It appears likely that (MSH2/SENP6) deficient cells are incapable of resolving the genomic lesions induced by PARP-inhibition, with apoptosis becoming a preferred response. Olaparib is currently in phase II clinical trials for the treatment of BRCA1/2-dependent breast and ovarian cancers -. Our findings suggest that it may also enhance the efficacy of strategies that target components of DSB repair pathways in MSH2-deficient tumors. This study describes the identification of conserved genetic interactions between the MutSβ subunits and orthologous genes encoding diverse biological functions in two evolutionarily distant yeast species. It further demonstrates that unexpected genetic relationships could be exploited to treat loss-of-function disorders. In the specific example presented, the synthetic interaction of (MSH2/SENP6) deficiency enhanced by PARP inhibitors indicates that a significant proportion of MMR-deficient cancers could be targeted via their loss of function in MutSβ-mediated recombinatorial, rather than mismatch, repair  (Figure1A). Ongoing studies have established the central role of reversible sumoylation in an efficient DNA damage response, suggesting that the SUMO pathway might contain novel druggable targets for anticancer therapeutics ,. In this work we suggest that targeting specific SUMO proteases may be highly effective in the treatment of MMR-deficient cancers. The recent development of SENP6-specific small molecule inhibitors  could prove invaluable for further experiments in this regard. CJR is supported by ICON plc and the UCD Newman Fellowship Program. This work was supported by the NIH (ES019966, CA76329 and CA93484) and an NCI Cancer Center Support grant to Albert Einstein College of Medicine (CA013330). ET, JAK, NJK, DP, MCK, and WE designed the experiments; ET, JAK, SS, HSK, CJR, and AR performed the research; ET, JAK, SS, CJR, MS, NJK, DP, MCK, and WE analyzed the data; ET, MCK, and WE wrote the paper. All authors read and approved the final manuscript.